Please Credit Photo: AAADT in Robert Battle's The Hunt. Photo by Paul Kolnik. Artistic Director Robert Battle’s athletic work for six men reveals the predatory side of human nature and the primitive thrill of the hunt. A thundering percussion soundtrack by Les Tambours du Bronx drives the explosive movement that runs the gamut from modern sports to the rituals of the gladiators. Battle found inspiration for the work in his background in martial arts, replicating the intensity and combative stances. Costumed in long black skirts with under layers of red, six men throw themselves into the movement, reveling in the thrill of the hunt, and challenging physical limits. There is a lot of foot rubbing and neck rolling in the room when you hang out with five men from Alvin Ailey American Dance Theater on a morning after they've performed "The Hunt." The furious and powerful ensemble work serves as the main calling card for Robert Battle, artistic director designate, on Ailey's North American tour. 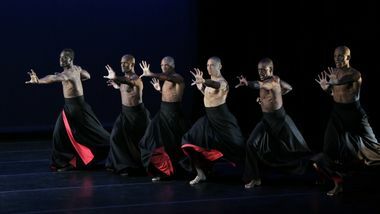 Imagine an evening at Alvin Ailey without "Revelations." It's pretty rare - ask director Judith Jamison about the complaints she gets when that signature work isn't on the bill. But Sunday night, the troupe showed some other works - a few revivals and some they've not danced before - all with that trademark Ailey punch.